Miss Peregrine's Home for Peculiar Children is an upcoming 2016 American dark fantasy adventure film directed by Tim Burton, produced by Peter Chernin and Jenno Topping and written by Jane Goldman, based on the 2011 novel of the same name by Ransom Riggs. The film stars Eva Green, Asa Butterfield, Chris O'Dowd, Allison Janney, Rupert Everett, Terence Stamp, Ella Purnell, Judi Dench and Samuel L. Jackson. Filming began in February 2015 in London and the Tampa Bay Area. It's scheduled to be released on September 30, 2016 by 20th Century Fox. 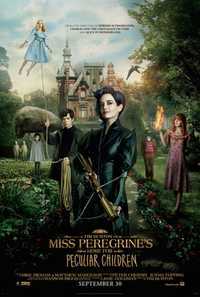 This webpage uses material from the Wikipedia article "Miss_Peregrine%27s_Home_for_Peculiar_Children_%28film%29" and is licensed under the GNU Free Documentation License. Reality TV World is not responsible for any errors or omissions the Wikipedia article may contain.